I like to play a lot of different styles of board games, and I’ve written numerous times on this blog about them. 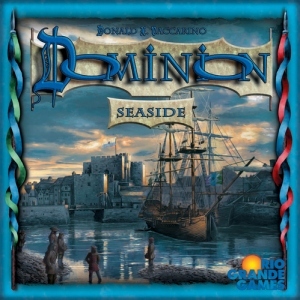 My wife and I own a wide variety of games, but my single favorite game is actually one that you won’t find on that list: Dominion. 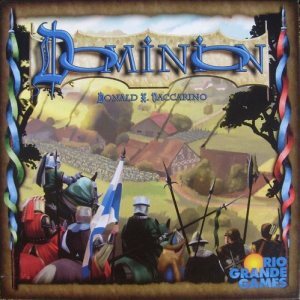 I first started playing Dominion regularly some time in 2009, a year after it came out. A group of friends in Avery previously got together often to play a variety of games, led by a grad student named Matt Loh who was a big board game aficionado. Pretty quickly, Dominion started being the only game we wanted to play. The first conceit of the game is that the Victory cards (Estate, Duchy and Province above) are necessary for winning the game but slow down your deck while you have them. Most strategies, then, build up more and more before eventually “greening,” that is, buying the victory cards that will score the highest points. The first challenge in Dominion is therefore figuring out the best time to start greening. By default, you begin every turn with a hand of five cards. You then are allowed to play one Action card, then spend your money and buy a card. So for instance, if you played a Smithy, you would now have 7 cards (five, minus one for the Smith you played, plus three) and could spend whatever money you drew. If you drew another Smithy, though, you wouldn’t be able to play it since you’ve used up your one action for the turn. The Market illustrates the four basic rewards a card can give you: You draw a card, can play another Action this turn, can buy an additional card this turn, and have $1 more to spend. You can see that having a bunch of Markets in your deck would be a lot better than a bunch of Smithies because you could keep on playing them, getting more and more coins and buys. Hence Market costs more than Smithy, $5 rather than $4. The second key card is in the Village card, which in addition to replacing itself in your hand increases your number of actions. This would let you play, for instance, a Smithy, and then continue to play action cards like Market thereafter. One Village-Smithy pair increases your hand size by 2, so getting a bunch of these together can build up bigger and bigger turns until you’re drawing your whole deck. Witch, on the other hand, hands everyone else a Curse, which is the seventh card that’s always in play. You wouldn’t want to buy it, but you’re happy to give it to your opponents. There are always enough Curses in the deck for ten Witches to be played; you obviously want to play more of them than your opponent(s) if you can. But life isn’t always about attacking each other; there’s also a Council Room, which lets everyone draw a card! Our group in Avery decided that every time someone plays a Council Room, we needed to say “yay” while drawing the card. The next big conceit of Dominion is in the Chapel card. Of course if you have some Curses, you’d love to get a Chapel to cleanse your deck of them. But perhaps the surprising thing is that Chapel is a very good card without any cursing, since you can trash those starting coppers and estates to build a more concentrated, smaller deck. It’s commonly cited as the best card in Dominion relative to its cost. Finally, Gardens is the other game-warping card in the base set, in the opposite direction of Chapel. With Gardens and the right combination of other cards (typically +Buy cards like Market), you want to get as many cards in your deck as possible, often even buying coppers for free with those extra buys. Finally, how does the game end? There are two possible ending conditions: All the Provinces are bought, or any three of other the sixteen piles are emptied. (Each Action pile has 10 cards in it, while there are always as many Gardens as Provinces.) Generally speaking, the Provinces are sort of the default game end condition, but if either everyone is so bogged down in Curses that they settle for Duchies or otherwise go for an alternative strategy like Gardens, three piles might empty first. Nothing really replaces playing the actual game, but I hope that this taste of some of the basic strategy tradeoffs that players face with just the cards in the base set of Dominion to give you an idea of how it all works. One of my favorite parts is that it is inherently rather apolitical; apart from the timing of ending the game, most decisions you make affect everyone equally. For instance, here’s Nobles, an Action-Victory card. For its action, moreover, you have a choice: A weak Village (no +1 Card), or a Smithy. You can see how this would pair nicely with such a deck; if you have a smithy, he can be a village, or vice-versa. On top of that, he gives two points to boot, allowing you to green a little bit later. Masquerade is probably still my all-time favorite card because of its unique interaction. After drawing two cards (not a small feat), you pass a card around the circle, or just back and forth if there are only two of you. Then you have a chance to trash a card, often the one you were just passed. Even though it helps to thin your deck, Masquerade forces you to keep around bad cards to pass to other players. There are a lot of interesting interactions to go with it. Intrigue also introduced one of the most brutal attacks in Torturer that single-handedly unfortunately ruined Dominion for some of my friends before they could really get into it. The attack is not really that bad alone; it’s the player’s choice whether they want to be Militia’d or Witched. But the problem comes when multiple Torturers are played, either by one player or by everyone. Notice how it doesn’t say “Discard down to three,” but “discard two,” meaning that you keep having to discard until you have no hand. Once the curses run out, the attack means nothing, so this should eventually be the goal. But in our 3- and 4-player games, no one wants to be the person who ends up with all the curses, so everyone would tend to discard, making the attack just as powerful as ever. We started to just veto Torturer whenever it came up randomly. Seaside brought in Duration cards like Wharf that have an effect both the turn you play them and the next turn. To keep track, you need to remember to set the wharf aside after playing; it’s bright orange to tell you this. Seaside also introduced mats and tokens. Island provides a mat on which to store cards you want to keep but not until the end, like Provinces or maybe your starting Estates. Finally, Embargo uses its own specialized tokens to keep track of which cards come with a curse when you buy them. Naturally, these new mechanics provide all sorts of interesting opportunities that we got to discover together, like that Wharf is one of the strongest $5 cards in the game, since drawing two cards at the start of your turn is so powerful. I could keep going, but I think you get the picture. Each new expansion comes along and introducing some new mechanic and potentially breaking some unwritten rule like there being no $7 or $1 cost cards. It was thrilling to discover these things together as a community. If you haven’t heard of it before, Caltech has a pretty cool Ditch Day tradition: In groups with their friends, seniors plan puzzles and activities for the underclassmen to enjoy for the entire day. These puzzles are called “stacks” (for historical reasons) and generally include a theme of some kind. My friend group ended up including several of the regular Dominion-playing crowd, and it became the clear pick for our theme. We decided to make stations based on each of the expansions that had come out to date: Intrigue, Seaside, Alchemy, Prosperity, and Hinterlands. For instance, the puzzle at the Seaside station required them to navigate a RC boat in a pool, except the person holding the controller would be turned away from the pool. My favorite puzzle, Intrigue, was one I shamelessly stole from a stack in another house the year before. We found a house near campus with several different rooms, and escorted each of the team members into four different rooms. In each room was a laptop with limited communication ability. Room A had a microphone that would speak to Room B, which had a one-way text chat that would be seen by Room C, which had a microphone to speak to Room D, which had a one-way text chat that would be seen by Room A. Three of the rooms had a sticky note with a word on it, and the fourth room was supposed to assemble all of those messages to give them a hint about where to look in their room for a secret codeword that would release them. The best part of it all was that we were also secretly logged into those chat rooms, so we could see at least half of the communication going on. It was very entertaining to read all of their half-baked theories of the communication structure — one even involved me as a part of the loop. Online Dominion: No more shuffling! Shortly after learning about the game, I found out that I could play it online at BrettSpielWelt for free. A couple of years later, an unofficial server at Isotropic became quite popular and spread among our community. This led to a bit of a revival of interest in Dominion for the same friend group in Avery, only we were mostly playing each other on our own computers whenever Matt wasn’t around. Online play also allows players to easily resign without feeling like they need to clean up the whole game. You can play the same number of games in a third of the time or less. The “Great Hall” of Isotropic, where players could propose matches with each other or request to be automatically matched. Screenshot taken from the Dominion Strategy Wiki. Isotropic unfortunately eventually met its end in March 2013, as the official license was granted to a series of companies to develop an official version of the game. I played the first new version a little bit but was ultimately disappointed with it and generally stopped playing online Dominion. We continued to accumulate expansions, playing the new ones when we got them. After Adam graduated and moved away, he left behind the expansions he had contributed as a gift. Fortunately, the rest of us kept playing, albeit more and more occasionally. As this friend group from GCF slowly but surely graduated and moved away, we started playing less and less Dominion together. We still have all of the sets together in one place, but haven’t played together in months. The previous contract for online Dominion expired at the end of 2016, and it was instead awarded to a new company called Shuffle iT started by a regular Dominion player who goes by Stef online. He created a new client from scratch, and on my first impression, it looked like the best iteration of online Dominion yet. I decided to give it a try. The new website uses a subscription model, but you can play a surprising amount without paying anything. The base set is free, and there are two subscription levels corresponding to half or all of the heretofore-released expansions. But when two players play, you play with the bigger of the two sets, which means that as long as you’re fine playing other people who have a subscription, you don’t need one yourself. As you can see, there is an option to be automatically matched with someone close to your ability level, as well as an easy way to find your friends and play with them. You can also play against a bot, although it will only play with whatever expansions you’re subscribed to. And if you’re only familiar with some of the cards, you can mark those and (under advanced options) restrict your games to only having a small number of unfamiliar cards. It’s a great system for both beginners and experienced players. Without sounding too much like a salesman, the subscriptions are also very flexible: You pick when you want them to expire, and in addition to a small transaction fee, you can pay a pro-rated cost of only a few dollars per month. This can work great, say, if you just want to play some Dominion over Christmas break and then get back to work after that. Could I win some money? After having played a lot of Dominion over the summer, I wanted a good way to finish it off. I found out about a tournament that would be taking place in mid-September through mid-November, and signed up for it. The entrance fee was simply to have the full subscription active through the end of the tournament. By the end, 389 total players signed up, and the tournament was set up as a giant single elimination bracket. We were seeded by rating, and I came in at seed #40, which gave me a bye in the first round. There’s been a round per week so far, and we just finished Round 6. 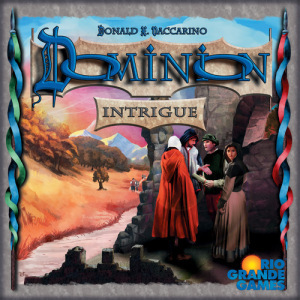 It’s been nearly ten years since Dominion first came out, and it’s still as popular as ever. With the release of Nocturne previews, the Dominion Strategy forum had its highest viewership day ever earlier this week.